Thank you for your scientific contribution at the RaMi-NGS conference 2016. Please find the conference talks in PDF format here. 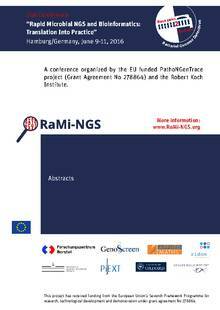 The consortium of the EU-funded project PathoNGenTrace was delighted to welcome you to the 2nd “Rapid Microbial NGS and Bioinformatics: Translation Into Practice” conference which will took place in Hamburg/Germany from June 9 to 11, 2016. The bi-annual meeting gathered experts from all over the world active in applying Next Generation Sequencing (NGS) techniques to discover the epidemiology, anti-microbial resistance, ecology and evolution of microorganisms. The 2016 conference was targeted at scientists from the academic as well as the public health, food, veterinary, clinical and microbial forensics sectors. In addition, the conference particularly addressed the interests of NGS data software developers intending to build a bridge between software developers and end-users. The conference was open to 140 participants. The PathoNGen-Trace project has received funding from the European Union’s Seventh Framework Programme for research, technological development and demonstration under grant agreement No 278864.